KEY CONCEPT: Recognising 3D shapes. 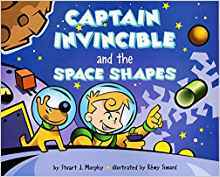 DESCRIPTION FROM THE PUBLISHER: Throughout their mission, the fearless captain and his canine sidekick encounter asteroids, poisonous gas, and alien beings. But will their knowledge of three-dimensional shapes, including cubes, cones, and pyramids, help our heroes navigate past these obstacles — and make it safely home?